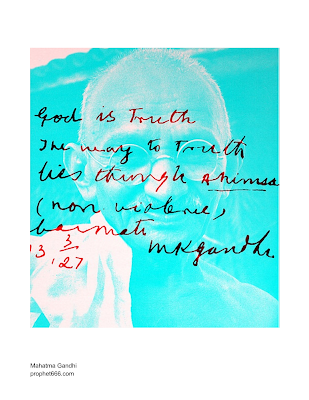 This is a famous Prophecy which was made by Mahatma Gandhi nearing the final moments of his life. Here one must remember that Gandhi was not the usual prophet. He was one of the greatest achievers of all time, having defeated the great British Empire without a gun. Gandhi never made useless statements in his life, what he said he always backed up through deeds.Hence this Prophecy has to be taken most seriously, for it is not one of those usual doomsday Prophecies MAHATMA GANDHI was also deeply Spiritual,though he never flaunted it. "Mankind is approaching hard times, because as soon as the measure of its sins will be full, it will be called to account by the superior power above us. You may call this event as you wish: Judgment day, final settlement, or doomsday. It will come, most likely, very soon. Whoever will survive this settlement will see an entirely new earthly existence manifested. For a long, very long time the world war will be crossed out from the dictionary of mankind, perhaps even for all time. Christmas, the festival of Christianity, will be accepted by all religions as the true festival of Peace. To clearly understand this prophecy one must understand the quotes of MAHATMA GANDHI on his views on what HINDUISM really means. The quotes give below are probably the best description of the Hindu religion. To Gandhi Christmas and Christianity were also a part and parcel of the Hindu religion, just like all other religions and sects.